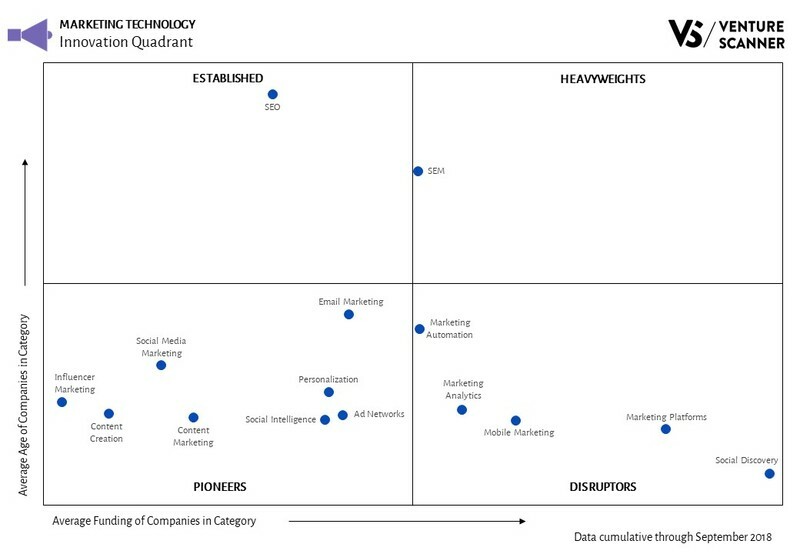 We see that the Pioneers quadrant has the most martech categories with 8. The Pioneer categories are in the earlier stages of funding and maturity. The Disruptors quadrant has 5 categories that have acquired significant financings at a young age. The Established quadrant has SEO as its one category, which has reached maturity with less financing. The Heavyweights quadrant also contains one category, SEM. This category has reached maturity with significant financings. We've analyzed the martech categories and their relative stages of innovation. Let’s now look at how they stack up against one another in terms of their total funding versus company counts. As the above graphic implies, the Marketing Platforms category leads in total funding with $11 billion. 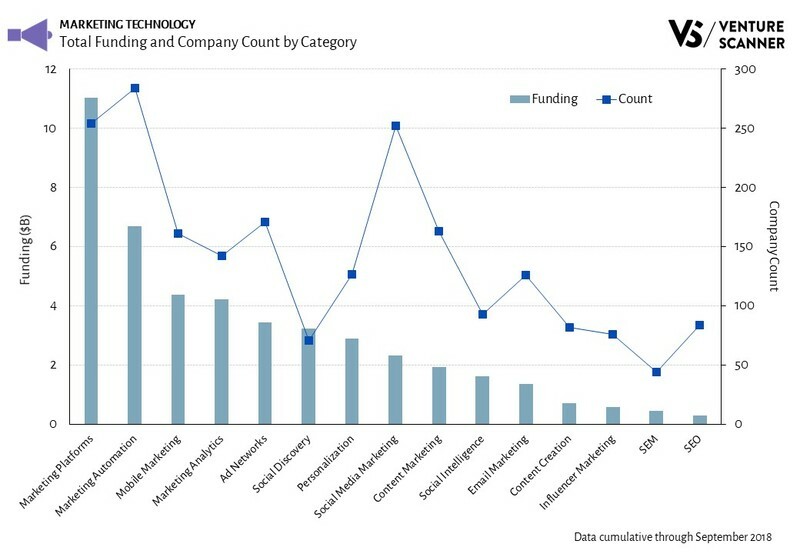 Its funding is 1.6 times the funding of the next category, Marketing Automation Software with almost $7 billion. Marketing Platform companies enable businesses to execute and manage marketing campaigns. It also contains customer relationship management tools used to improve customer engagement. Some example companies in this category include Showpad, Sprinklr, Gainsight, and Medallia. The analysis above demonstrates Marketing Automation Software leads the sector in total companies. The Marketing Platforms category leads in total funding. We'll see how things evolve during the rest of 2018. 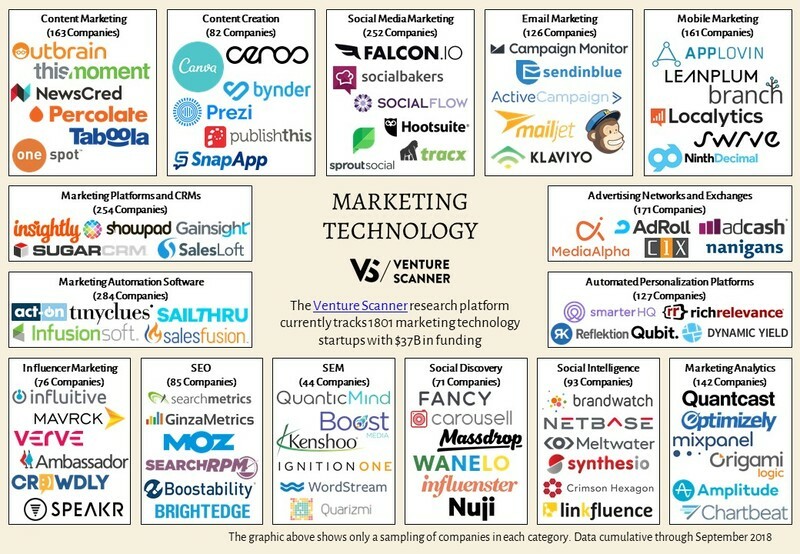 To learn more about our complete marketing technology report and research platform, visit us at www.venturescanner.com or contact us at [email protected].